I love marshmallows. Not so much on their own but I grew up eating a lot of s’mores and drinking a ton of hot cocoa, so every winter I start to crave their sticky, sugary sweetness. As an adult, I really appreciate a toasty mug of hot chocolate, spiked generously with Rumple Minze, topped with melty marshmallows. 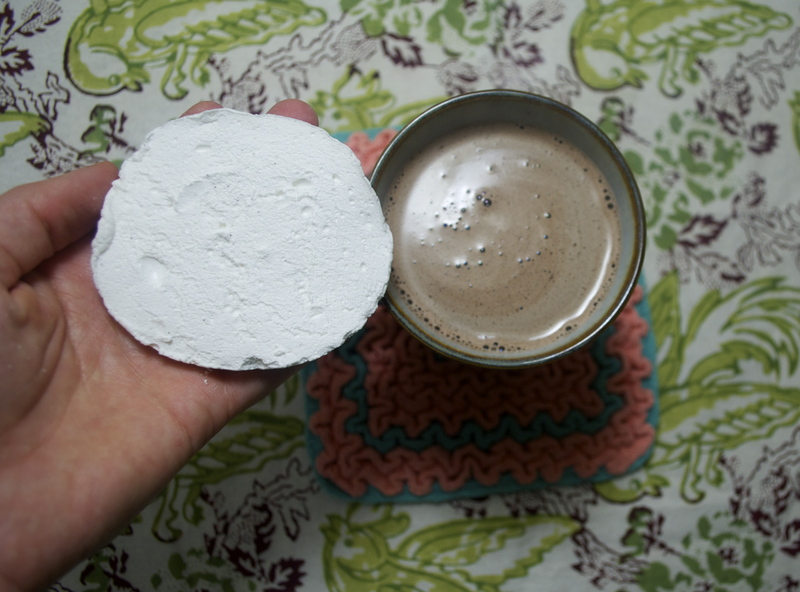 Last year, when this blog was just a baby, I decided to try making my own marshmallows with (shockingly) great success. I was so impressed with myself that this year I thought I’d take it one step further. 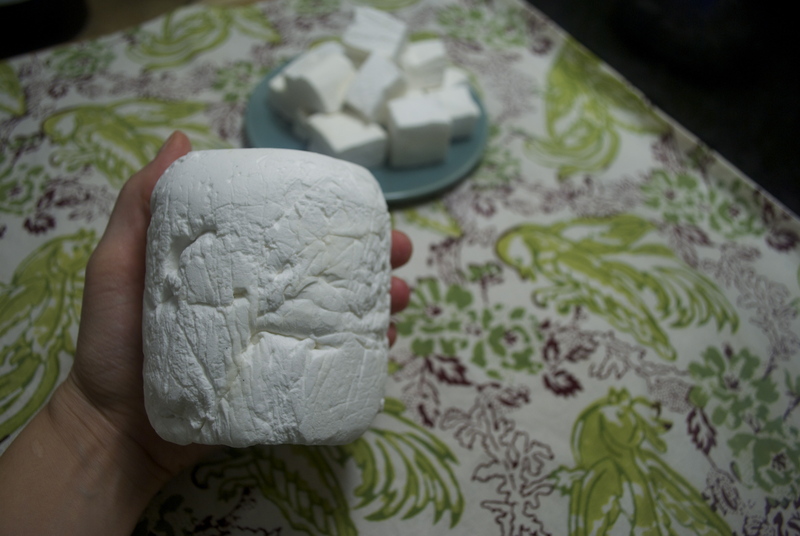 Inspiration hit when I discovered these giant two-pound marshmallows online. (As an aside: I love Plush Puffs, their flavors are fun and — big bonus! — they actually taste good too. Not at all rubbery, just soft squishy marshmallow goodness.) Then, on the same site, I saw another item the company offers — mug toppers. 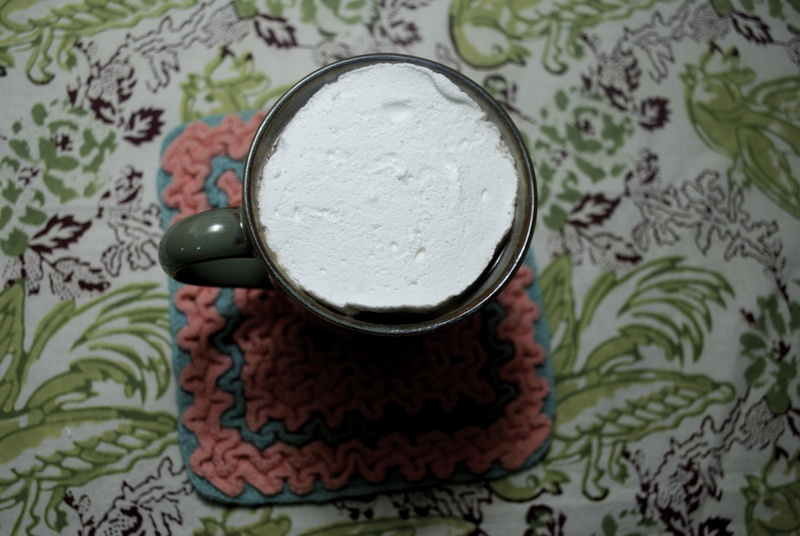 They are slices of marshmallow that perfectly fit a cup of cocoa. Seriously brilliant! I tore through my kitchen trying to find something that I thought would work as a mold. Eventually I settled on the base to a store’n’pour, a piece of restaurant equipment usually used for salad dressings and the like. Once it was well coated in butter and plastic wrap, I got busy making my marshmallow mixture. I used the same recipe as last year — Martha Stewart’s Vanilla Marshmallows. 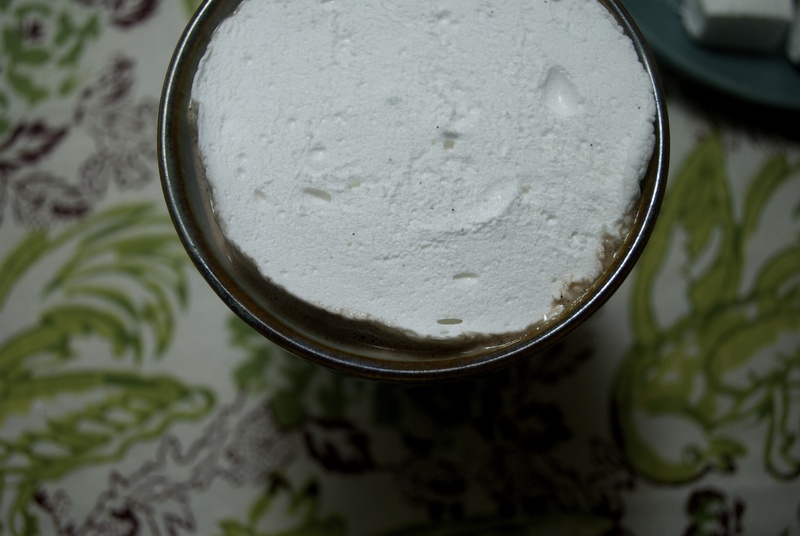 Making marshmallows is so much easier than you’d think if you’ve never done it before. Last year I was intimidated, this year I was ready for it. Yes, it’s a little lumpy and a little bumpy, but I am still patting myself on the back for creating it. And no matter how wrinkled it is, the slices still came out perfect. A perfect fit — mission accomplished! They wouldn’t be smiling like that if they knew what was in the mug! This entry was posted in Christmas, Crafts & Holidays, Edible Treats, Edibles, Gifts, Holiday Ideas, Sweets and tagged christmas, DIY, food, holidays, marshmallow, projects, recipe, winter by Jessamine in PDX. Bookmark the permalink. Haha! It’s always good to have a little mind-meld! =) Please let me know if adding bourbon works out well. I’d love, love, *love* to make boozy ‘mallows. That sounds amazing! This was certainly a fun experiment and it made me feel more comfortable playing around with the mixture. Last year I was totally petrified of screwing it up. 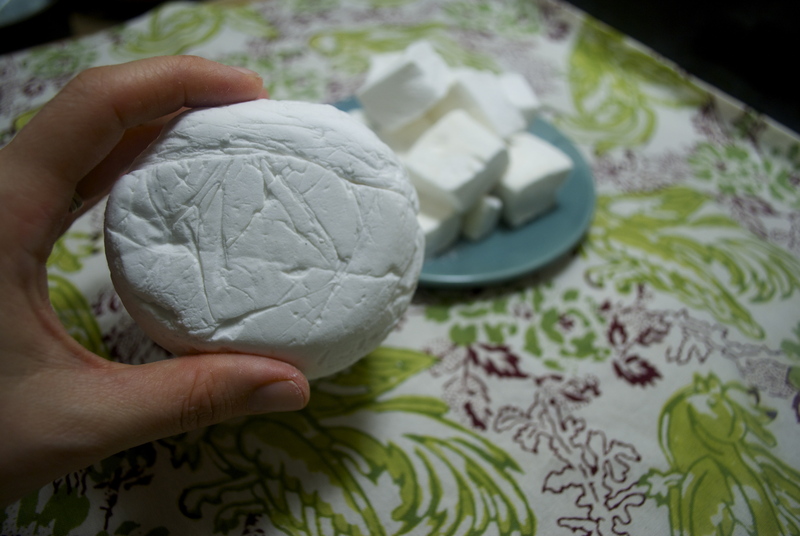 Marshmallows seem like they’d be so complicated — if only I had known years ago how simple they really are! That is so perfect, I’m in awe 🙂 Never made my own marshmallows, but if you say it’s easy, I”ll give it a try! Yay! I’ll be expecting to see evidence! Now the hard decisions…vanilla or peppermint? if you keep yummy booze or caramel or fun flavorings in the house, go for vanilla. I like to mix up my cocoa with Kahlua, Amaretto or Rumple Minze, so vanilla works best because it doesn’t compete. But if you’re a plain cocoa (plus marshmallow) person, peppermint would be delicious. I love that you made your own mug toppers! I have been holding off on making my own marshmallows but I’m definitely intrigued now! Thanks! I was pretty excited they turned out so good. =) Give them a try — I promise, so easy and so satisfying! Wow those look INCREDIBLE! 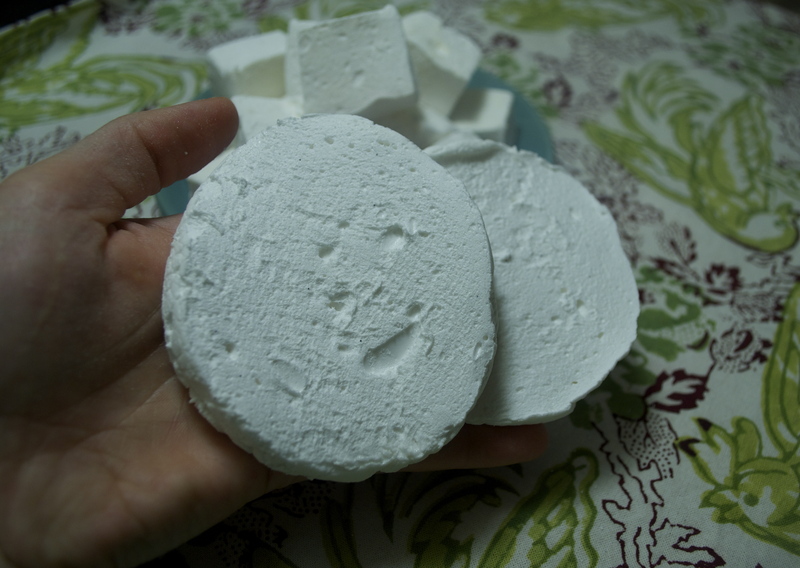 You have inspired me to make my own vegan marshmallows. Love that topper idea! Thanks! you’ll have to let me know if yours work out. I’ve never tried them with anything other than gelatin so I’d love to know it’s successful! Thanks for reading! 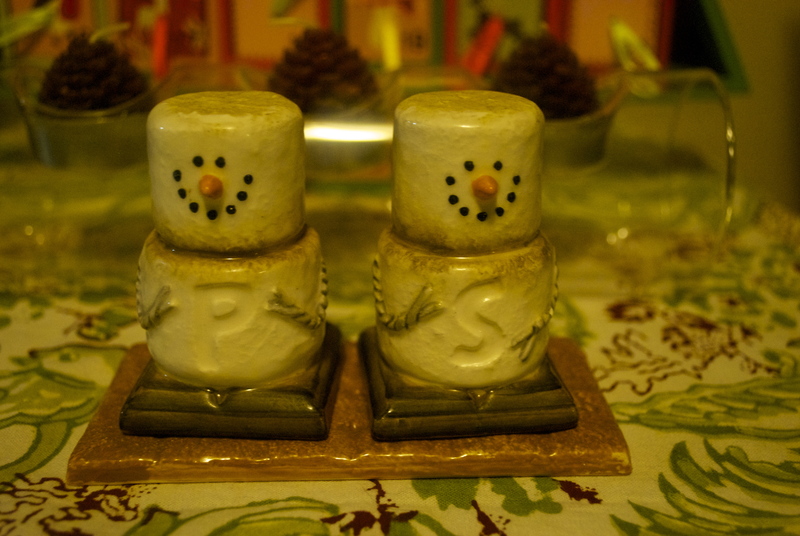 =) You should have seen the 2-pound one I bought for my brother’s family. It was HUGE! I was literally speechless when I pulled it out of the box. So cool! My kids would be in heaven with a 12 ounce marshmallow. They might not sleep for a week, but sleep is overrated, right? Go big or go home! I love this. Why add loads of small marshmallows when you can just add one massive one?! This made my day. What a fabulous idea!! LOVE IT!! I’m a HUGE fan of marshmallows! Plain, dipped in chocolate, covered in caramel.. I could go on. LOL! 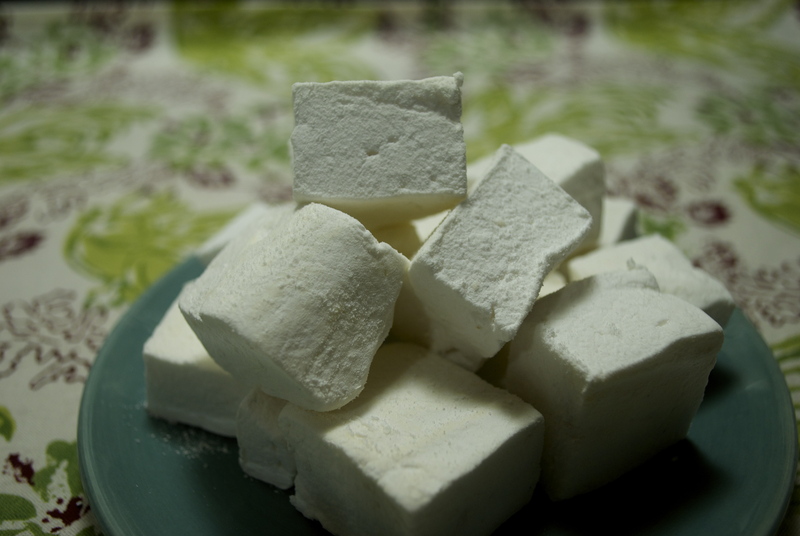 I picked up the book, Marshmallow Madness!, earlier in the year and made marshmallows for the first time. So much fun and like you said, so much easier than I would have ever thought! What’s the best way to store the mug toppers and how long can u store them? I’ve kept them in ziploc bags for at least a month with no problems. Obviously, they’re better the first couple of weeks after making them, but they last a long time, just keep them away from humidity and heat. I’ve never tried freezing them, but Plush Puffs (maker of the original mug topper) says you can freeze their marshmallows to extend their shelf life. I’m sure it would work well for homemade too. 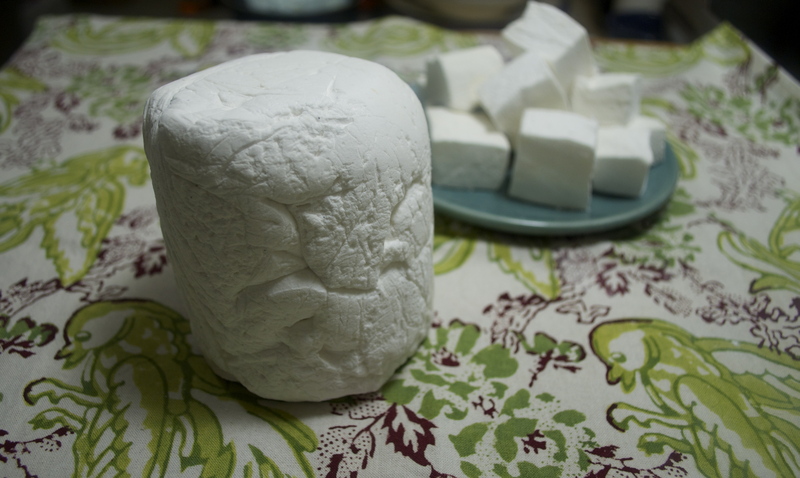 I’m drooling thinking of ways to use homemade marshmallow. So, was it easy to drink around the mug topper or did it act as a stop-valve? Yum. Oh yeah after it melted a bit it had a thick whipped cream consistency, easy to drink through. Though in the beginning I was worried I’d have to cut a hole out of it! How about using a muffin top pan for the mold–would that work?